Check out the simple recipe below, and don't forget to watch the video for a few extra tips and tricks to making this dish a little easier to prep. Bring a large pot of water to boil on high heat. Add 1 teaspoon salt. Carefully add potatoes to the boiling water. Cook for 10 to 20 minutes, until potatoes are tender. Don't overcook the potatoes; check frequently for doneness. When potatoes are done, drain and run under cold water until they are completely cool. 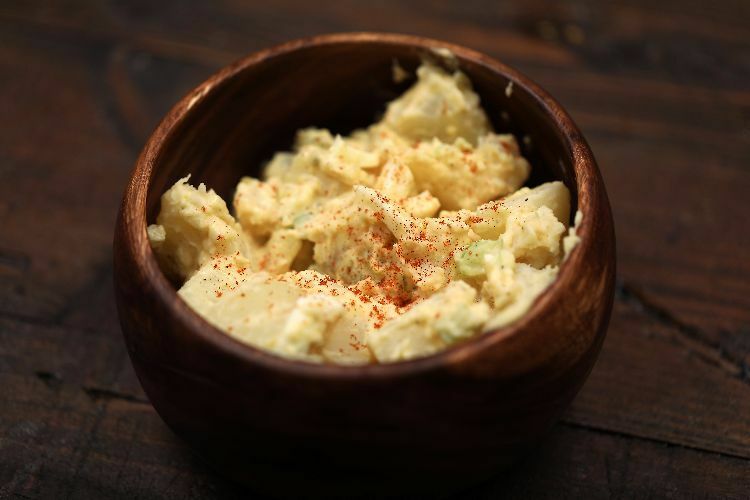 In a large bowl, mix celery, onion, eggs, relish, mayonnaise, mustard, sugar, paprika, 1 teaspoon salt and pepper. Garnish with extra paprika and fresh chopped parsley if desired. The key to this satisfying dish is a rich creamy gravy, and the key to an excellent gravy is a good roux. Looking for a bacon-infused Southern dish?